Indiana Jones in San Felipe. There has been the skulk and secrecy of Hollywood in San Felipe, Baja, Mexico in the past. Richard Burton and Liz Taylor back in the early seventies. More recently, Ray Liotta in the sublimely forgettable Infierno, as it was called in its Mexican release. And then Vin "The Desert" Diesel and the largely unseen final scene of The Fast and Furious, an Easter Egg that followed the credits. San Felipe is close to the US border, has a comparatively inexpensive pool of labor, cheap property leases and a wonderful geography that can double for any tropical or desert country. It has been ripe fruit for the Hollywood orchard pickers for years. And now maybe, perhaps, it has finally arrived at full blush and ripeness with the latest rumor that buzzes through its tatty streets. 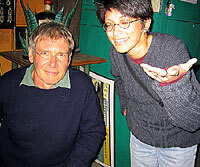 Harrison Ford is in town..
Tom Luxon, an Associate Professor of English from Dartmouth College, saw Harrison Ford dining at the Baja Mar last night (January 2, 2004). Tom's son Isaac shook hands with the actor and told his father "...the guy was really drunk." Harrison's private plane is said to be sober and tethered down at the airport. Priti Joshi, visiting San Felipe for the first time, also met Harrison at the Baja Mar. "He was very nice," she said and went on to describe Mr. Ford's demeanor as unpretentious, "...not what I expected from a Hollywood luminary." 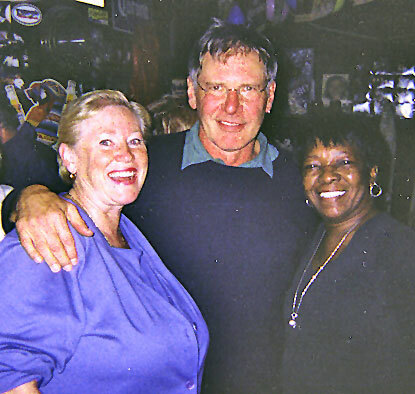 She added that once Harrison was recognized and word spread throughout the restaurant, people began to crowd him and buy him drinks. "He got really tanked," Priti admitted. The photos shown here were taken by Priti's sister Priya, below, under Indy's whipless right hand. 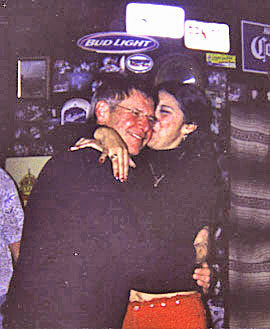 Several other people recounted meeting Ford at Al's Backstreet Bar, which he apparently found after his meal at Baja Mar. All of them said Harrison was very friendly and approachable, didn't begrudge the shuttering cameras that gathered around him. Blueroadrunner will try to get some of these Backstreet Bar shots and post them here. These sightings certainly beg the question What is Harrison Ford doing in San Felipe? Well, an obvious logical leap would be Indiana Jones IV, because the food at the Baja Mar is not that good. Pre-production has indeed begun on the 4th Indiana Jones film. Artists have begun work on story boards and concept artwork for Indy IV. The script, based on a George Lucas story, was written by Frank Darabont. Indy 4 is scheduled to shoot for 8 weeks in Kauai, Hawaii. Directed, of course, by Steven Spielberg. Two of the Indy girls will be his old team mates Karen Allen and Kate Capshaw. Filming of Indy IV will begin sometime in 2004, either in June or late summer. The latest word on the release date of Indy IV is July 1st, 2005. 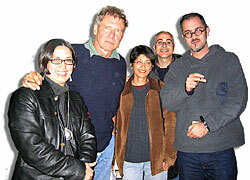 Harrison with the Joshi family. No word on Baja or San Felipe. So what is Harrison Ford doing in San Felipe? Maybe he wants to show us he can hold his liquor better than Ray Liotta or Richard Burton. Who's next? Tom Hanks? Movie star Harrison Ford has revealed his relationship with Calista Flockhart is "on the rocks", during a drunken night out in Mexico. The Indiana Jones star, 61, was presumed to be pressing ahead with wedding plans with the former Ally McBeal star, 39, after the finalization of his divorce from ex-wife Melissa Mathison last week. But, after downing at least five tequilas with beer chasers and dancing and flirting with local women in a bar in San Felipe, Baja California, the "drunk and bewildered" actor told revelers of his two-year relationship with Flockhart, "It's on the rocks". Locals were stunned to find themselves in the company of the normally reclusive star, after he flew himself in on his own private jet and stayed in a local hotel. 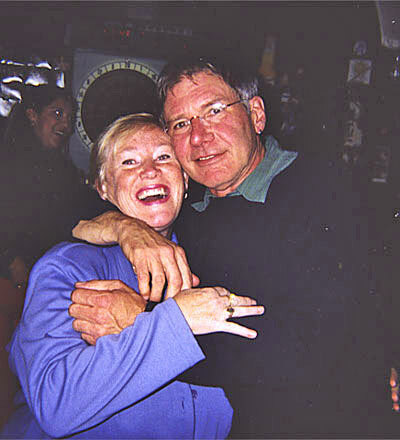 To put fanciful rumors to rest, Harrison did NOT stagger away from El Marinero (Al's Backstreet Bar) using a blonde woman for a crutch. As you can see above (click thumbnails to enlarge), he politely offered himself as mannequin and camera fodder to anyone with a camera. And later, he was driven back to his hotel by Al, the owner of the bar.